One of Wales’ first BIM Level 2 exemplars and Anglesey County Council’s most advanced BIM project to date, building Holyhead Primary School put pressure on the relatively inexperienced client and project team and exposed compatibility issues between construction and infrastructure BIM software. The £9.9m project involves construction of a two-storey new build and the remodelling of the grade II-listed Cybi building, an empty Victorian red brick school complex, built in 1904. 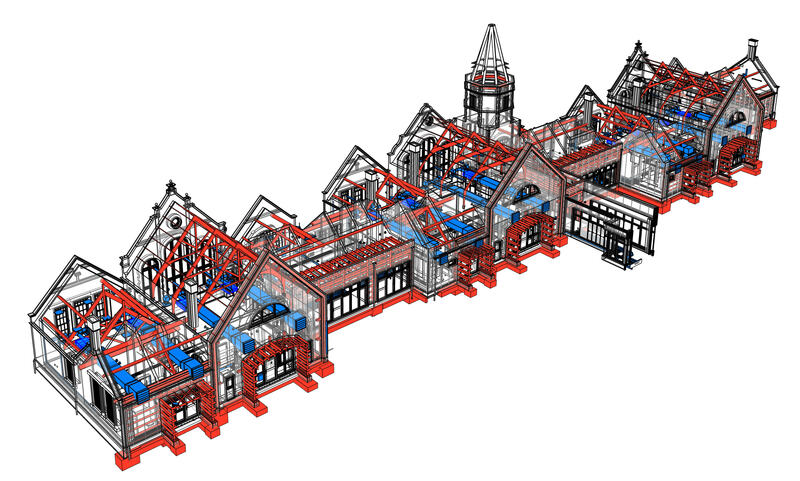 Chester-based Lovelock Mitchell Architects is leading the implementation of a fully coordinated BIM model, on behalf of design & build contractor Wynne Construction. BIM will be taking the full journey, from design coordination and clash detection, through 4D construction sequencing, with an “as-built” asset model set to be developed to produce data drops for use by Anglesey County Council’s FM team. The project is currently at a late design stage and due to start on site in November. Software from 4Projects was used to create a common data environment and host the fully federated model, combining separate Revit models of the architecture, by Lovelock Mitchell, the structure and civils, by Caulmert, and the building services, by Environmental Services Design (ESD). Wynne Construction is working with its suppliers to develop the final detailing, which is being fed back to the design team to add into the federated model. The historic Cybi building was painstakingly modelled in Revit by Lovelock Mitchell, based on surveys, photographs and a large number of existing drawings, then incorporated into the federated model. A large portion of the building’s rear elevation will be demolished, but the front elevation, with its three main gables, slate roof with red tiled crestings and tall chimneys with ornate capping detail, will be retained and refurbished. “All the individual historic building elements, including the feature stonework, have been incorporated within the model, most of which were modelled by the architects,” says Smith. Caulmert is responsible for structural modifications to the existing building, and any new structural elements, all of which have been fully coordinated within the model. “The process worked well, particularly as Wynne’s design manager was heavily involved and could arrange any site investigation works required,” he adds. Ground conditions on site include varying depths of rock, from 1m to 3m deep. The rock was modeled in Revit to determine how to optimally position the new build to avoid any unnecessary rock excavation work – deep enough to use the rock surface to support loads and avoiding the need for any expensive breaking out. 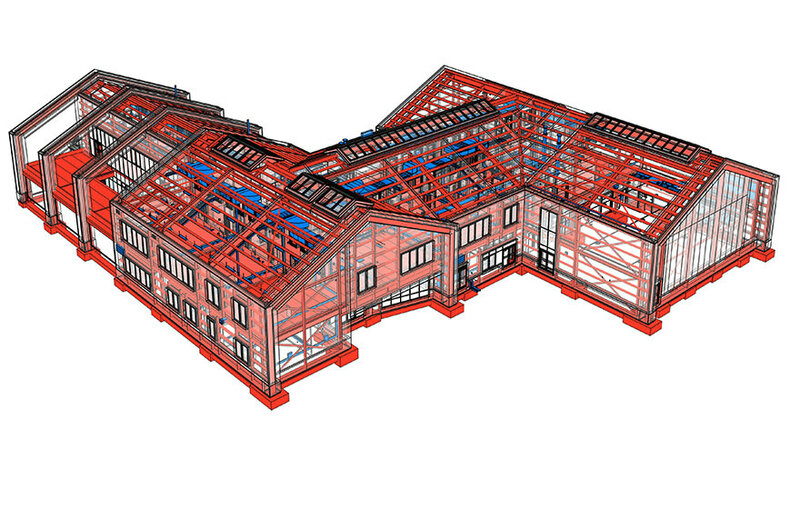 Caulmert’s structural model, built in Revit, integrated neatly with the architectural model, but bringing in the infrastructure and landscaping elements was more complex, requiring extra effort to convert IFC files produced by AutoCAD Civil 3D to enable them to be read by Revit. Clash detection exercises, carried by Wynne and the design team, uncovered a total of over 50 clashes that needed resolving prior to going to site. The coordination process took around two months, to go into the level of detail required, Caulmert even placed an engineer full time in the architect’s office to speed up the process. “Despite all the effort expended at the front end, we feel confident that BIM will save time and money and benefit the scheme in the long run. A key lesson learned has been the need to educate people upfront to engage with the process. In many ways it feels like the industry has gone full circle with BIM, returning us to a time when the design was always done upfront, before going out to tender then building a project,” Smith concludes. I'd be interested to see if this model was accurate i.e. including the bending of the timbers, non-plumb walls etc. This could be an essential factor in the model being useful for services allocation etc.